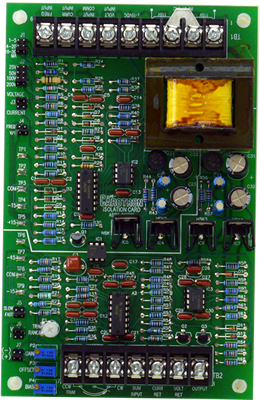 Each input signal is conditioned by scaling circuits that can be modified via multi-turn OFFSET, BIAS and GAIN potentiometer adjustments on the Signal Isolation Card. Terminal strip connections are provided for an external Trim pot. and an external Summing Input. A single turn TRIM RANGE adjustment is supplied on the Signal Isolation Card to limit the range of the external Trim pot. The output circuit can be configured to source either a voltage or a current. Typical output ranges for this signal isolator are 0 to +10 VDC, 0 to 20 mADC or 4 to 20 mADC. *Note: Carotron has released a new Din-Rail mountable Signal Isolation Module (Model SIM200-000), which can be used for new or existing applications.